The embroidered Butterfly was in my collection as a sample so I finished the embroidery and made it into a tiny little Twilt. So, I have a Twilt on a Twilt. Buttons are used to hold it in place. 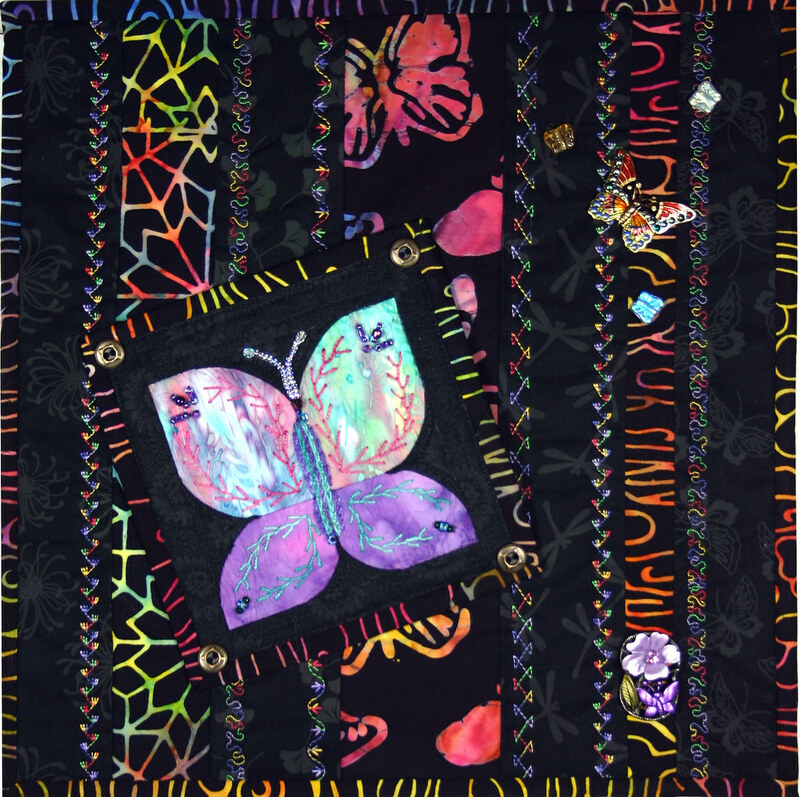 I added some Butterflies from my Button and Bead collection. The curves that form the Butterfly’s wings are 3D triangles with rolled bias folds. What a nice way to continue to welcome Spring. Don’t you think? It’s another beautiful day here. 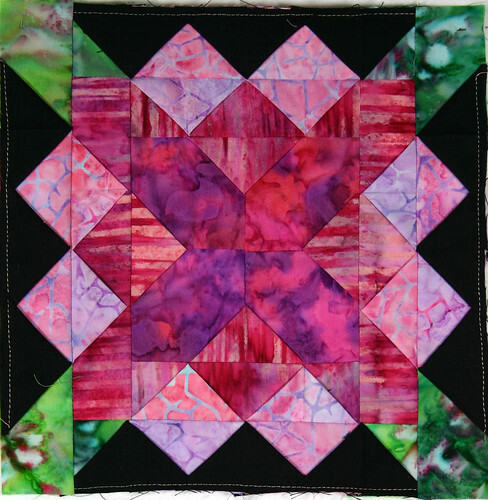 I am off to help The Quilt Attic set up for the Glendale Quilt Show. I will also be squeezing a Workshop in at a local guild. If you happen to be at the show please come by and say Hi! It might seem like I am only working on Twilts these days and that might be partially true, they are addicting. 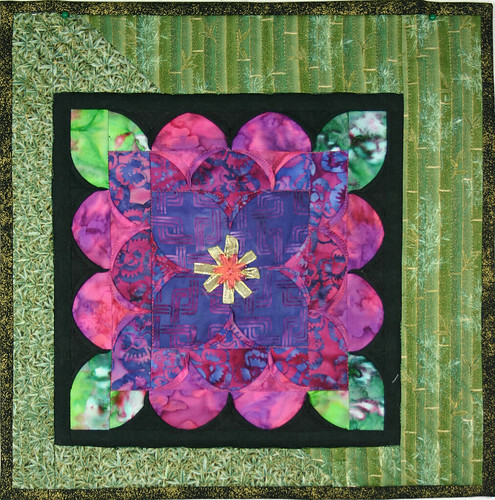 This is a Cathedral Window Quilt that has already been pieced. My assistant, Myke, is holding it down while I baste the top to the batt and back. The next stage will be a grid and the final stage will be the rolling of the bias folds that form all the curves. Unlike the traditional method used to make Cathedral Window quilts, in my method the entire top is pieced before any folds are rolled. 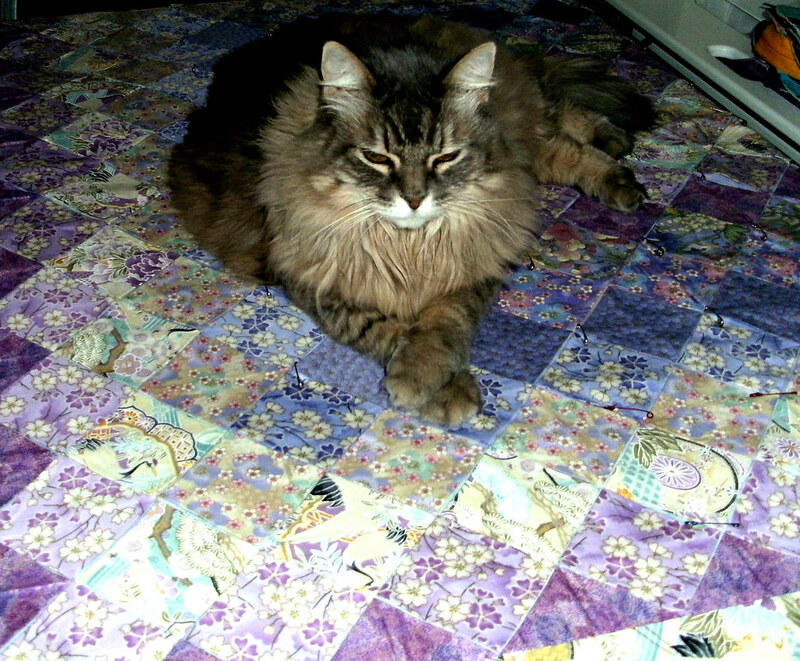 I will be finishing this quilt in the same manner as the Layers of Lavender Workshop sample. There will be more to come as I make progress. I finished up this piece this morning and as I sit here writing this a pair of Redtail Hawks are doing their spring mating dance outside over the trees. It is a beautiful day. I have quite a collection of fabrics, Asian designs and Batiks are my favorites but I love all kinds of fabric in general. Within the collection of Asian fabrics I have a number of prints that are miniature in scale and have wanted a project to use them in. This twilt uses 36 different squares of these prints for the foundation squares. “Best Wishes for Good Fortune” uses a 3″ copy of the block from my pattern Fortune Cookie. 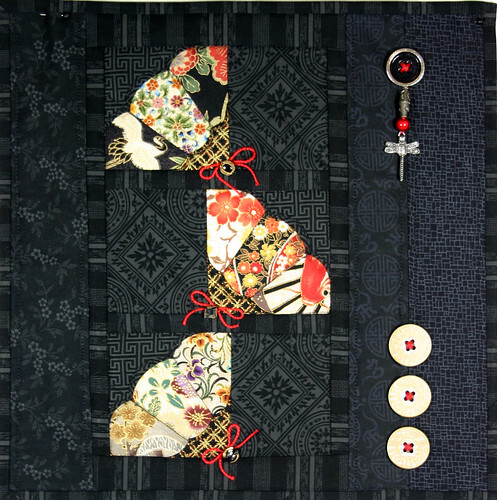 Each block uses a black square and four smaller Asian print squares. They are sewn together like a 3D bowtie block creating a black square on point with four bias folded edges. 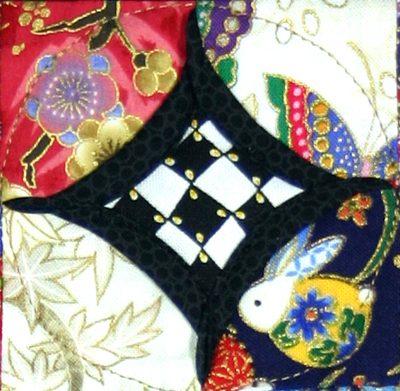 A checked square is laid on top of the black 3D square and the folds are rolled over the raw edges and stitched. If you haven’t tried a Twilt yet I invite you to give it a try. I have found the process a very productive way to generate creativity. Check out Jessica’s latest Twilt, Ring of Fire. 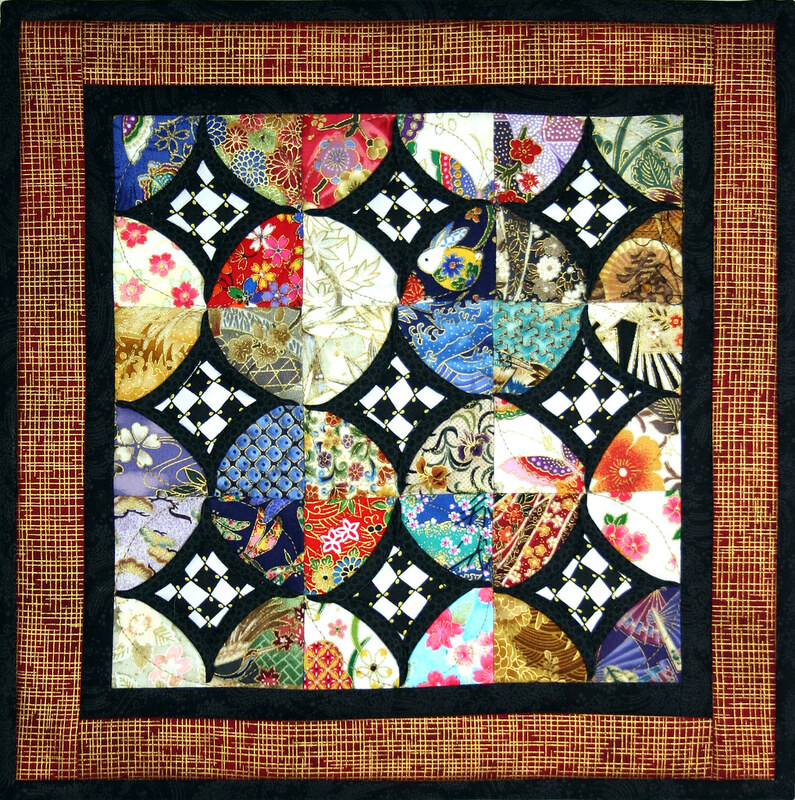 For more Twilt info check out Twitter Quilts….Twilts. The grass is green and the sun is shining. I left my door open yesterday to enjoy the moderate temperature. It made me think of Spring which is just around the corner. So this Twilt welcomes “Spring’s Arrival”. The flower is a much smaller version of the block from my pattern, Lotus Lullaby. This is what the block looks like before it’s quilted. It uses 3D triangles to form the petal shapes. A couple of my more recent patterns, Cathedral Window Stars and Cathedral Window Hugs and Kisses, use these blocks. They are Ohio Star blocks with X and O centers, they achieve the look of a Cathedral Window block but are not interconnected as the full version of my technique. 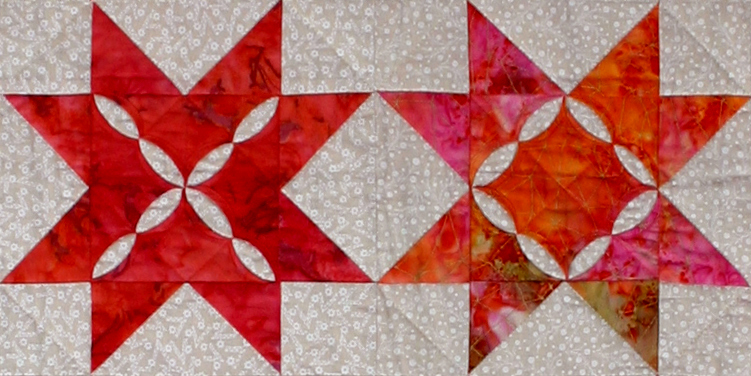 They are a good place to start when trying out the 3D piecing used in my designs. Opposite colorways also show the different effects that can be obtained with these blocks. I’m a little behind updating my website so these patterns aren’t there but I have started a pattern page here on the blog. So, check it out. Tuesday’s are going to be Twilt day. It will keep me motivated to make at least one Twilt a week unless someone else makes one and I can use theirs. This week you get both. Jes from I’m so Happy has made her first Twilt, “Lisa and the Sky of Diamonds” and it’s lovely and has a significant sentiment. Check it out on her Blog. I think she might be starting another too. Mine is just a simple piece that uses bias curves to create little fans. I created a little foundation paper pieced fan and than basted the folded squares on top so that I would have bias folds to make the curves. 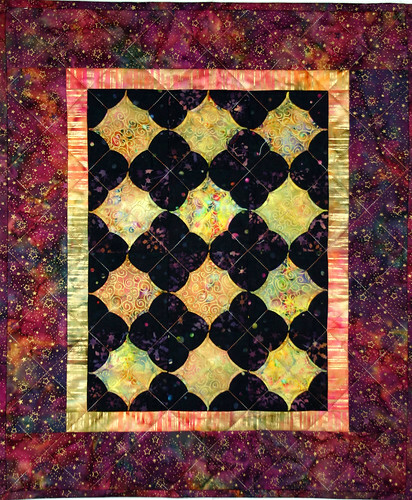 I just finished up this class sample that uses one of my patterns, Star Puzzle, but I have reversed the contrast. Sometimes its good to see what a pattern will look like using different fabrics. A 3D square, like the 3D bowtie block is the basis for this design and the first step to a Cathedral Window using my method. 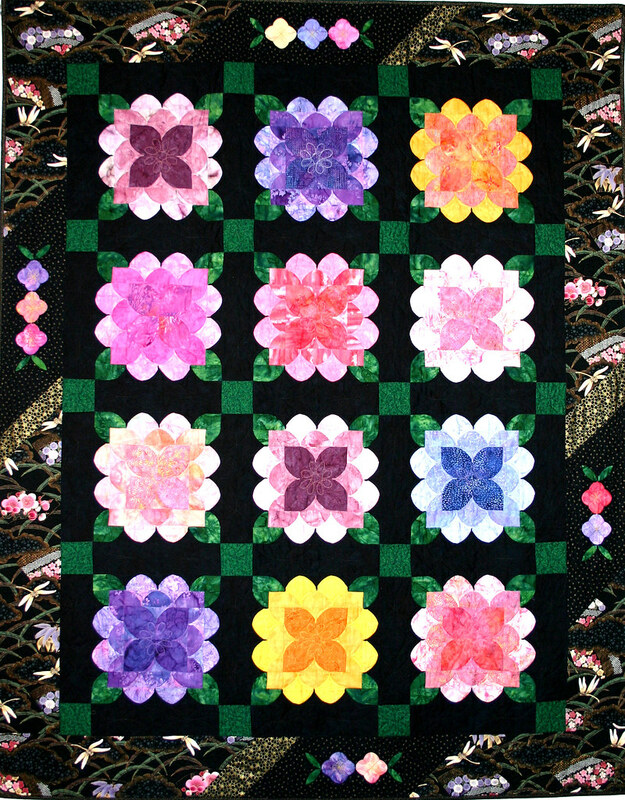 Below is a closeup of what the blocks look like at the quilting stage, after the grid is stitched but before any of the folds have been rolled. The finished version is next to it. Intrigued?